At 11cm in length, Sideswipe is a reasonably accurate scale replica of a Lamborghini Countach. An incredible amount of detail has been sculpted into this toy including windscreen wiper, headlights, indicators and various grills, vents etc. Like many of the early Transformers, some of the detailling on this toy was dependent upon stickers. In vehicle mode, stickers provide black accents along the sides and roof of the car, additional headlights on the bonnet (with the words "rallye racing" written beneath each headlight) as well as the Autobot and Lamborghini insignias. Stickers on the rear of the car provide additional black and metallic red accents with rear lights and licence plate decos. The rear licence plate reads "Countach." The car is coloured red, with a black front fender. The black tyres are made of rubber and have also been treaded. Each hubcap has five rings and is coated with silver chrome paint. The Sideswipe toy is derived from Takara's Diaclone Car Robot line, and thus there is a vestigal driver's compartment inside (although the Diaclone pilot is not provided with the toy). The driver's compartment isn't terribly detailled and is rather plain. The major drawback of this mode is that the robot parts are clearly visible from underneath the toy -- although this isn't a huge problem, since cars are seldomly seen from the underside. Pull the rear section back and separate robot legs. Flip feet down. Pull out robot arms. Lift up forearms. Swing down bonnet and flip up robot head. Attach weapons. Standing at 11.5cm, Sideswipe carries over the colours and components of the vehicle mode. The more exposed robot parts now add various black, white and silver accents to the toy. The head, hands, waist and shins are black. The face, forearms and feet are silver. The stomach, thighs and parts of the shoulder are white. Various stickers around the toy add additional blue, red, black and silver accents throughout the toy. Sideswipe's missile launcher is reasonably strong for an old Transformer (the original Transformers' missile launchers were intentionally weakened for safety reasons): Sideswipe's launcher shoots up to 40cm. Sideswipe feature four (five if you include the head) points of articulation in this mode, and is essentially a brick of a robot. 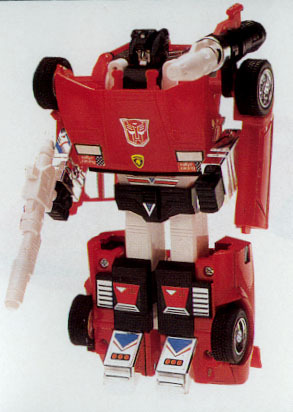 In 1991, Sideswipe was re-released as a Classic Hero. It's essentially the same toy, except with a gold packaging stylised with typical 1991 Transformers fonts and package designs. In 2001, Sideswipe (known as Lambor in Japan) was re-released with Red Alert (known as Alert in Japan) as part of Takara's Generation One line. Click here to read Generation One Lambor's review. A nicely sculpted vehicle mode and a decent looking robot mode, however, the almost lack of articulation doesn't make Sideswipe a terribly exciting toy to play with by contemporary Transformer standards.